I haven’t ever done a book review here on the blog. I’m not exactly sure why… perhaps it just hadn’t ever occurred to me. My bookshelves are full of review-worthy books, though, and I’ve been toying with including a semi-regular feature called “Seabrooke’s Bookshelf” wherein I share books I own or have read, and which I think my readers might be interested in themselves. Today’s the first installment; how frequently I post future items will be up to my whims. 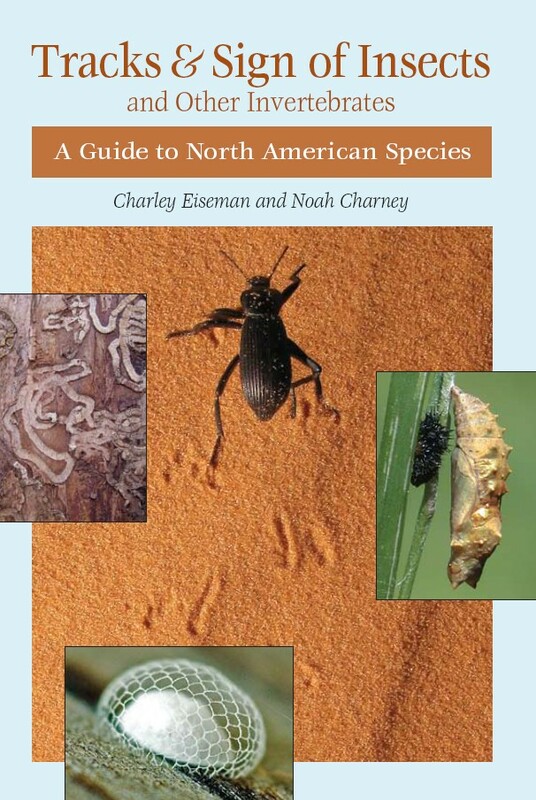 I was inspired to start because of this book: Tracks & Sign of Insects and Other Invertebrates: A Guide to North American Species by Charley Eiseman and Noah Charney. The book has been on my radar for about a year or so; I’d submitted a photo of a mummified caterpillar to BugGuide.net, which Charley Eiseman was patrolling. He commented, explaining what it was, and then sent me a note inquiring into the moth guide (which I have included in my profile) and mentioning his own book. This April his book was released. I had a gift certificate I’d been holding onto since Christmas, and I’d been intrigued enough by his note to want to get myself a copy. I ordered it (along with the DVD of Avatar, released about the same time) for myself for my birthday. I had expected a good book, and knew that it was going to be informative simply because it’s the first book to treat signs of insects and not just insects themselves. But the book exceeded my expectations: it’s excellent. It’s more of an information guide than a field guide; the references are in chapter/section/paragraph format rather than the plate-opposite-text format found in most field guides. This allows them to go into more detail than just captioning photos would. The book is stuffed with full-colour photographs, many taken by the authors during a 15,000 mile, 40-day road trip they undertook for the purpose, but quite a few of the photos were collected from other amateur and professional entomologists, including several names that I recognize from BugGuide. The text is information-rich and easy to read, organized logically under headings and sub-headings. The various categories of insect sign are organized under broad chapter headings such as “Eggs and Egg Cases”, “Leaf Mines”, “Galls”, “Sign on Twigs, Stems and Stem-like Structures”, etc. Eighteen chapters treat everything from exuviae (shed exoskeleton of the moult from nymph to adult) of dragonflies and the like, to the scrapings left by a snail’s “teeth” as it forages, to the folded-over leaves many caterpillars and other insects use for shelter, to the various burrows some insects make in the sand. There have been many instances in the past couple of years, doing blog posts about interesting insect signs that I’ve run across, that I could have benefited greatly from this book. Although it would be impossible for the book to cover every sign presented by every species in North America, it covers enough ground to at the very least help set you on the right track even if it doesn’t have exactly your item. For instance, I could have saved so much time when I was trying to figure out what these mines through the cambium layer of bark might be – I spent several hours trying to Google the darn things, finally ending up determining that they were probably flies of the genus Phytobia. In sitting down and flipping through the book shortly after it arrived in the mail I discovered the photo on the page at left: instant diagnosis. The book indicates that these mines are made by the larvae of moths in the genus Marmara, and lists which moth species use which tree species as hosts. Not being positive of the identity of the tree, I’m not sure which mine were. If there’s one tiny disappointment I have with the book, at least from the flipping I’ve done so far, it’s that they don’t have a broader treatment of the different bark beetle gallery patterns encountered on dead logs and trees. Thirty-two pages are given over to the many different styles and patterns of leaf mines, but only four pages cover bark beetle galleries, which are among the most easily-observed of insect sign during the winter months. Still, if that’s the only complaint I have, I’d say the book has done a pretty darn good job. I should point out that the book isn’t simply a reference book to help you identify things that you’ve already found while you were outside. It is also a great way to discover new things to look for next time you’re out hiking… or even just around the yard or garden. I bet there’s lots of things in this book that you never even realized were insect sign, and you’ll go back to have another look at. Or, stuff that you might have passed by without a second glance that now you’ll know to investigate for possible insect evidence. I highly recommend this guide to anyone who, like me, has a tendency to pause and puzzle over curious things they encounter while out hiking. Eiseman and Charney have done an outstanding job compiling and disseminating what is undeniably an overwhelming amount of diverse information. This book will be taking a spot on my bookshelf right next to my Kaufman Guide to Insects as one of my primary go-to insect guides. Make this the next nature guidebook you buy. I promise you won’t be disappointed. For more information about the book and/or the authors, visit the book’s official website (you can also buy a signed copy there! ).